Learn how to build web applications from three Microsoft MVPs. After building the data application layer using Entity Framework Core and a RESTful service using ASP.NET Core, you will then build the client side web application three ways: first, using ASP.NET Core, then using Angular 2, and, finally, using React. You will be able to compare and contrast these UI frameworks and select the best one for your needs. .NET Core is a complete rewrite of the popular .NET and its related frameworks. While many concepts are similar between .NET Core and the .NET 4.6 framework, there are revolutionary changes as well, including updates to Entity Framework Core and ASP.NET Core. 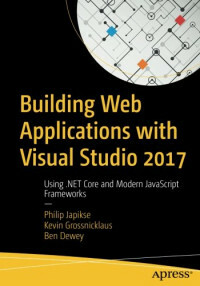 The first section of this book covers the three main parts of building applications with C#: Entity Framework, ASP.NET Core Services, and ASP.NET Core Web Applications. Prepare for Microsoft Exam 70-486—and help demonstrate your real-world mastery of developing ASP.NET MVC-based solutions. Designed for experienced developers ready to advance their status, Exam Ref focuses on the critical-thinking and decision-making acumen needed for success at the Microsoft Specialist level.